For the colors, I changed Ami from a white dress to a blue... I do think I might've picked too bright of a blue, but at the same time I didn't want her dress to be too light compared to the others. Rei went from pink to red dress... I mean, I can understand the pink, but she is MARS and FIRE and needed red. It was calling to her and she often wears a red dress when she dresses up in the anime D= As for Makoto... well Jupiter needed green and the yellow looked too passive for someone with her passions and stuff >.< Chibiusa's yellow dress looked too light and blended too much with both her scarf and Usagi's dress. So I wanted her dress to be more of a pink she deserves and to stand away from Usagi and show they're two people and not just a mix of dresses. Saturn's dress was the right colors but FAR too light. Thus I just brightened it up some but not overwhelmingly so. The moon was taken from the original scan and NOT vectored. Instead I pushed the colors around the peps in front of the moon so that the old, not vectored characters wouldn't be seen or get in my way. Then I went and add/removed noise and basically smoothed the moon over. The background behind I actually made BEFORE I had completely finished my vector. Well I started it, did the last touch ups on the background once the vector had been complete and put on top of it. Used a cloud brush with some stars and sparklies for the background on top of a ligth blue to dark blue coloring. Pretty simple, huh? xD Added the vector, added the moon, then went about changing the lightening and working on that. The wallpaper part technically only took about half an hour (spread over 3 cuz I was forced to raid and work on the wallie in between pulls). The vector I did over a spread amount of time but I think it took a good few weeks. I'd have to check for exact day I started on the vector. That's freaking awesome! You did a great job, and I really like it! owwww....they all look so beautiful. nice wall! I really love this wall. 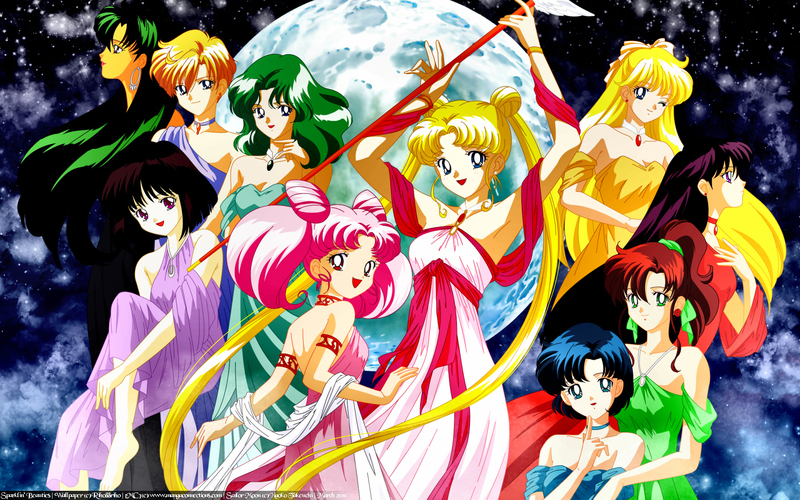 I think you made good choices on the color changes of Ami, Makoto, Rei and Chibi-Usa's dresses. I agree with your reasoning and it looks fantastic. I also think it's weird the original scan just cut off the outers (aside from Saturn) bodies. You did a lovely job adding to it. This looks fantastic. I can see that you put a lot of work into this! The only thing I don't care for is the color or Setsuna's skin, it came out a bit too orange. I know you wanted to go with a similar bg to the scan but it might have been more interesting to place them in a garden or something rather than just use the starry sky as a back drop. Excellent work on the vectoring, though!